He might have been best known for the Ministry of Silly Walks during his Monty Python days, but this may be taking things a bit too far. British comedy legend John Cleese took a $5,400 taxi ride from Oslo to Brussels after becoming stranded in Europe's volcanic-ash travel crisis. Cleese was visiting the Norwegian capital to take part in the popular Scandinavian talk show Skavlan. "We checked every option, but there were no boats and no train tickets available," Cleese told Norwegian TV2. So he hopped in a cab (which had to carry two extra drivers for the 1,500-km drive) and hopes to make it to Brussels on Saturday morning in time for the Eurostar trip back to London. "It will be interesting. 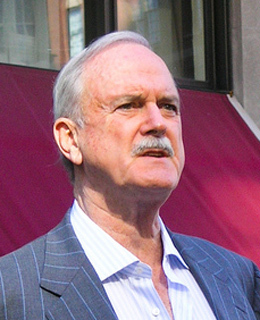 I'm not in a hurry," Cleese said, which is good to hear, considering the distances involved. "I will think about a joke you've probably already heard: How do you get God to laugh? Tell him your plans," Cleese said, before setting off on his epic journey. See 40 years of Monty Python.